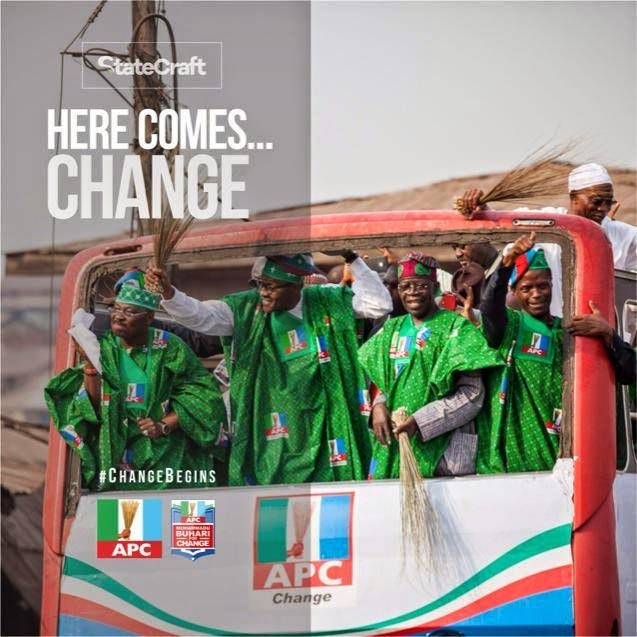 Koye's Blog: Now we WIN!!! Congratulations Nigeria! Congratulations General Buhari!!! Now we WIN!!! Congratulations Nigeria! Congratulations General Buhari!!! I did not plan to write a Blog post today. As expected, I am too emotional to adequately express my thoughts. One moment, tears stream freely from my eyes; the other moment, I break out in screams. I said I would dance on the streets if Buhari won, and I just did. I went out with my gate-man, Mohamed, and we had a good spin near the gates of Ogudu GRA. We took no pictures that may come back to haunt me in future, so don’t ask. As I sit at my desk again now, I am reminded of the many futile conversations of 2011. I have a horrible fear of embarrassment, but for the first time in my life – I put them aside to speak to people about voting for Buhari. To say that I was washed is an understatement. I was thoroughly embarrassed and chased out of at least two houses in Ibadan. I was blocked on Facebook. Erstwhile friends sent me hate messages and posted hate on my wall. At some point, I was forced to stop people from being able to post on my Facebook wall. Out of the shame of those days, I have kept that setting till now. I still have a campaign song from the 2011 campaign, and thanks to Facebook – I still have many of the thoughts I publicly shared at that time. I met @atomlim online shortly before 2011, and we became 'closer' during the Buhari campaigns as we often saw things from the same perspective. @atomlim now works with Obasanjo. ...when it became obvious Buhari would lose the 2011 elections. I was so touched by his candidacy that I committed publicly to someday share the extent of the influence he had on me. I still plan to! I predicted this about President Jonathan's presidency... Unfortunately, I was mostly right. With all my pessimism at the time, even I couldn't have foreseen losing our girls to Boko Haram! Now, joy washes over me. I am crying now. Rivers. I am so happy for Nigeria. I am so proud to be Nigerian today. I am proud that we have demonstrated the power of the ballot to the current crop of politicians. I am proud that the majority has made a choice for change; a choice to state that we will not reward incompetence with continuity. The road ahead will be tough. General Muhammadu Buhari has a lot of work to do. He will inherit a Nigeria that is nearly broke, a bloated Civil Service, obfuscated records, and many failed projects. He will inherit the unenviable task of righting a massive ship that has floundered for too long. Many people think him a Messiah, and expect miracles. Multiple interest groups have supported his effort to be President, and expect all sorts of rent in return. In 2011 I was young and impressionable, swept by romantic ideals. It is four years down the line, but my reasons for supporting General Buhari’s candidacy have not changed – they have only become more coherent. I have supported Buhari since 2011 because I believe he will combat corruption, re-unite Nigeria, appoint competent aides and Ministers versus rent-seekers, create an enabling environment for our economy and institutions to flourish, and restore our pride before Africa and the world. I now add ‘defeat Boko Haram’ to that list. Why do I support Buhari? Here's the 2011 version. I now leave you with the following lyrics, from a song that has inspired me since 2011… Go here to download the full song. Believe me when I say it's an amazing one. Unfortunately, I don't know who performed it, and Google couldn't help. Now I can see you smiling,Aisan o ma si mo o, Aini, aije, airilo ti lo. (Sickness has disappeared, now we have enough, enough to eat, enough to use). UPDATE: I must commend President Jonathan for presiding over the first elections in the Fourth Republic that will see an opposition party defeat an incumbent, and for (reportedly) graciously conceding! The good Lord bless you Prez GEJ. Otuoke and truck-loads of retirement kolanut await! And I must appreciate Professor Jega. He is a real hero! Change has kept me Mute suddenly. Long live the Federal Rebuplic of Nigeria.